1971’s Android at Arms brings us ever closer to the end of this review series. It’s not a Norton I encountered as a teen. To my surprise, even without the nostalgia factor, I kinda liked it. It succeeds in being creepy; indeed, it’s one of the creepiest Nortons I’ve read. Andas, Prince of Inyanga and likely heir to the emperor, went to sleep in a lavishly appointed bed chamber. He wakes in a stark prison cell, which comes as something of a surprise. Andas isn’t alone in the prison. His fellow prisoners come from many worlds, but all have one thing in common: they all are important people, at least on their own planets. Someone has gone to a lot of trouble to kidnap powerful (or potentially powerful) people. That someone might be … the Psychocrats. Or the heirs of the Psychocrats. It’s impossible to tell, as the villains rule through their machines. On the basis of surprisingly little evidence, the prisoners convince themselves the mass kidnapping is only half of the scheme. The villains must have built android doubles for the prisoners, then swapped those doubles for the originals. Using the strategically placed androids, androids conditioned to obey their creators, the villains can control the galaxy. Bwahahaha! The prisoners have been suspended in stasis. They wake up when the prison’s stasis machines break down; they escape the prison because the locks have failed as well. They manage to get off-planet, thanks to the automated spaceport nearby (a spaceport like the one in Galactic Derelict ). Home again? Not so simple. It soon becomes apparent that no two of prisoners agree on the date. The dates that the prisoners remember, from the time just before their abduction and suspension, span decades. Andas might be returned to his home world only to discover that decades have passed while he was held in suspension. As it turns out, that is exactly what has happened. That’s hardly the worst revelation waiting Andas. He discovers that his double, now middle-aged, now emperor, is a family man, with a wife and daughter. There are two Andas, one young and one old, one without children and one with. But … androids are sterile. If there is an android Andas on Inyanga, it’s not the middle-aged family man. Is it possible that Andas is … an android 1? Whatever he is, there seems to be no place for him on Inyanga. Salvation for young Andas comes in the form of an inter-dimensional gate: this universe’s planet Inyanga has no need of a spare Andas. The Inyanga a dimension away desperately needs someone like Andas. A usurper in one world, he may be a saviour in another. This is yet another Norton novel with an inter-dimensional gate. Gates seem so common in the Nortonverse that it’s odd that none of the great interstellar powers have noticed and exploited them. Although… the usual pattern is for the gates to send people from low magic worlds to high, so the gates may useless to most of the inhabitants of Norton’s more hi-tech settings (though for a few, they are a path to escape). Inyanga seems to have been settled as part of the same effort that settled Khatka, planet of the magical negroes, as seen in the Solar Queen series. Happily, this is a less problematic take on the African interstellar diaspora than Norton’s earlier book, Voodoo Planet . Of course, if you peruse my review of Voodoo Planet, you will see that it wouldn’t be hard to do better. There’s another tie to the Solar Queen series: Andas’ closest ally is a Salariki. We read about their introduction to interstellar civilization in Plague Ship. While the characters in this novel view androids (and excessively humanoid robots) as abominations to destroyed on sight, nothing about Andas, if he is indeed an android, suggests that this prejudice is in any way well-founded. This violent antipathy towards artificially created humans is just another instance in which Norton’s humans are bigoted dicks. But if there’s one thing fiction teaches us, it is that members of despised groups can win conditional tolerance for themselves (if not their general class) by risking or sacrificing their lives for the prejudiced majority, (Is there a TV trope for that? It seems like there should be.) Andas seems to have earned himself a happy ending—at least that’s how I read the end of the novel. I did take one positive note from this, although I don’t know that Norton intended it as such. The human settled realm in this is so huge even great empires are rumour at best to distant regions, as Rome was to China and vice verse. Perhaps the great collapses in novels like Dark Piper and Star Rangers are as localized as the fall of the Western Empire was, rather than heralding the general extinction of humans. 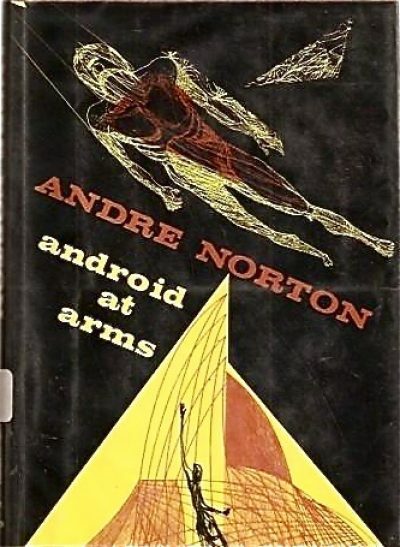 I wonder if Norton ever considered ending Android at Arms at the moment when poor perhaps-an-android Andas finds out that he’s not exactly echt human? That would have been a pretty dark ending for Norton. Darker even than the ending of Dark Piper (where, as we all remember, the human survivors seemed pretty likely to die). Perhaps too dark for a writer of juveniles, which may be why she included the second, other dimensional, half of the story. 1: Andas could be a clone. He could have been kidnapped from another dimension;it’s a plot point in this book that other dimensional duplicates exist. The main reason we might believe that the Psychocrats created a set of brainwashed androids is that it seems like the sort of thing they would do.